When I was a child, my dad used to call me “Marie Antionette” in a strictly unflattering way. You know, that “No bread? Let them eat cake” probably fictitious reference. What was a piqued interest, became a full historical blown girl crush, upon watching Sofia Coppola’s Marie Antoinette. 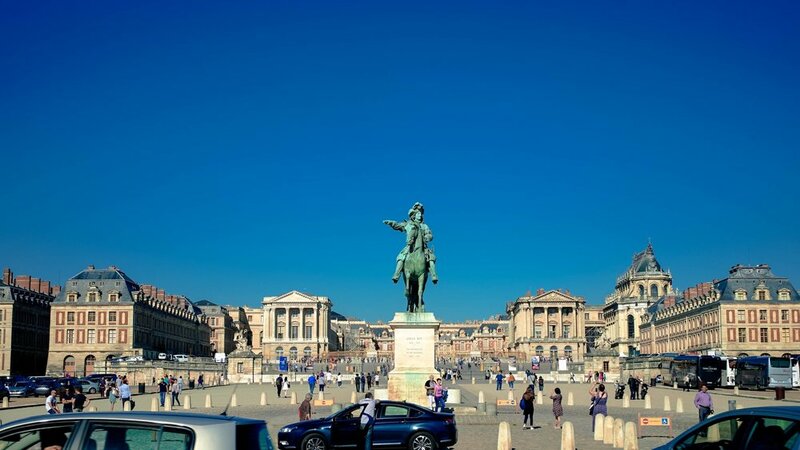 So Versailles was going to be a pilgrimage of sorts. As always, Genevieve had our breakfast of delicious coffee and croissants ready at 8.30 morning. She had toasted some brioche as well - our first time tasting the stuff, and yeah, I am a fan. I’d read about endlessly long queues that the Chateau promised if we got there late. Let’s just say that I did some terrible vacay behaviour. I woke Sahit much too early for his ‘vacational’ sentiments. But hey, we didn’t catch a 14 hour flight and crossed 7000 odd kilometres to sleep, did we? Our 7-day Metro pass worked just fine for Versailles as well. We had to change trains in between and during the course of figuring which side of the rails we needed to be on, did some heavy working out of our threadbare French. A few Parisians’ working English skills broke into a sweat as well on that hot late summer day. In the train, a couple of men played the accordion and I was very, very charmed. 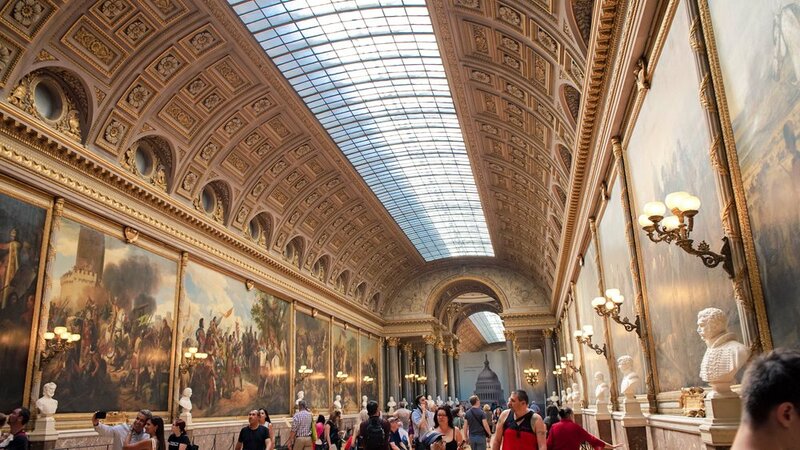 Versailles has three train stations - Versailles Rive Gauche, Versailles Rive Droite and Versailles Chantiers. We alighted at Versailles Rive Gauche, which is also the closest to the palace. It was a hot day and we didn’t particularly fancy a walk. The Palace of Versailles or The Chateau de Versailles used to be a hunting lodge until Louis XIV decided to shift base. The Sun King's vision was brought to life by and by, in the face of great resistance of his courtiers. Louis XIV was king from the age of four and his reign extended for over 72 years - the longest recorded term of any European monarch. HIs birth was considered something of a miracles, since it was preceded by a succession of still borns. So much so, that his life was considered a gift from God. He identified with the god Apollo, making parallels to the patron of peace and arts. His fixation with the Sun must have come from all that attention of being a manifestation of divine benevolence. And like how the sun sat pretty in the centre of the universe, giving life to and nourishing all things around it, Louis XIV perceived such parallels with himself that he adopted it as his symbol. His bedroom even faced the east so that sun would shine right into it as it rose. The Chateau contains 2,300 rooms spread over 63,154 square meters. 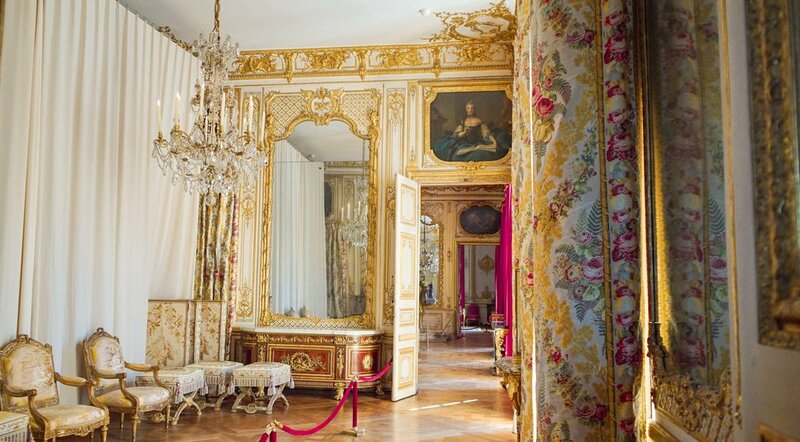 And the recurrent thought as you walk past grand room after OPULENT room is “No wonder there was a revolution” Gold, maroon, velvet, sighs, crystal, a caught breath, satin, lace, indulgent sunbeams, history and chandeliers define a walkthrough of the Chateau. Everything is as grand as advertised. And it takes some measure of imagination to accept that all before you, is a watered down, post-revolution version of how things used to be. Versailles was lovingly curated and put together by a very determined king. The Hall of Mirrors, like beautiful things has a shade of dark marring its image of perfection. In order to make a show of justifying the expense of building the Chateau in a France riddled in hardship, the finance minister Jean-Baptiste Colbert decreed that Versailles would be a showcase of France and that everything would be created in France. But Venice held the monopoly and had perfected the art of mirrors. Mirrors were expensive and were considered a status symbol. 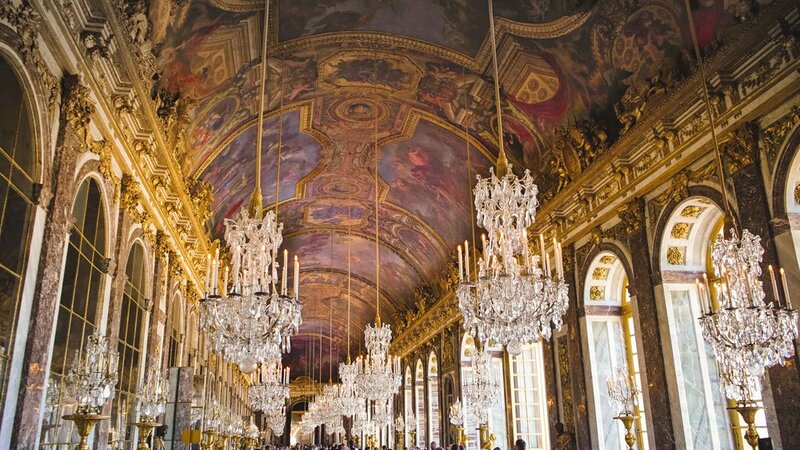 So the Hall of Mirrors was one hefty status symbol, designed to astound its visitors - which it has in full capacity across its career spanning four centuries. The minister had coaxed a few artisans to come over to France and craft the mirror for the Hall. But legend has it that the Venetian government wasn't to happy about sharing trade secrets and ordered their assassination. Was everything beautiful in history paid with money and blood? I've heard stories that the builders of the Taj Mahal had their hands amputated. We made our Versailles trip on a very, very hot day in September. We were so spent by the time we were done with the Palace that we had no time for the Estate of Trianon, the gardens or Marie Antoinette’s estate. We were just too exhausted. The Hall of Mirrors was swimming with people, and just about every room was been invaded by selfie sticks. But nothing quite disappointed me like having the Queen’s chambers being closed of for repairs and maintenance. But no matter, I’ll take it as a “You must come back” from the ghost of Marie Antoinette. The evening was still quite young and we had taken a power nap on the train ride back to Paris. We let Paris dictate the way once again. And we landed on a grassy patch, right opposite Les Invalides. We'd had enough of museuming for a day. So we sat outside and just watched Paris go by. A few kids came and began a game of football. A few Parisians stretched themselves out on the grass and made a quick siesta out of things. A girl sat reading on her picnic blanket. And we, broke open a bar of Lindt and took it all in. Les Invalides is a complex of buildings dedicated to the military history of France. It was commissioned by Louis XIV to honour France's soldiers. It began as a hospital and a home for war veterans and today has military museums and monuments. The Dôme des Invalides which was inspired by the Saint Peter's Basillica in Rome is the resting place of Napolean Bonaparte and other well decorated names in France's military history. We had maxed out our museum energies for the day. So we just chilled out on the grass until sunset. We walked down Pont de Alexandre III just the lights begun to come on. The sky was doing its trick of deepening into rose gold. This elegant bridge is named after Tsar Alexander III, who finalized a Russian alliance with the Third Republic in 1892. The bridge itself was built to commemorate the Exposition Universelle. The four pillars that stand sentinel at the ends, hold figures that represent the Arts, Commerce, Science and Industry taming Pegasus. The bridge celebrates the Belle Epoque with its Art Nouveau influences. And that's how we ended up in front of the Eiffel Tower once again. This time round, we stayed for the Lights. And our efforts were rewarded with a gracing of swans - my first ever encounter with non-zoo swans. That evening was a spell. The Seine glistened gold in the afterglow of the sunset. Witchy carousel music and lights filled the night with candy swirls. Of course you had the tricksters abound, vying for your attention - ignore them and you’re okay. And then the Tour de Eiffel came to life with the soul of stars and diamonds. It was magic as magic can be. If anybody has the audacity to tell you that Paris isn’t romantic, don’t believe them.